Ecwid was developed in the city of Ulyanovsk and has now grown into a leading provider of e-commerce solutions on Facebook with over 500,000 merchants in 175 countries. Young Russian programmers from the city of Ulyanovsk, which among other things is the birthplace of Soviet founder Vladimir Lenin, began developing the software platform Ecwid at the end of 1990s. The solution enables clients to easily add online stores to a website or social network page in just five minutes. The easy-to-use online store-building platform has attracted over 500,000 merchants in 175 countries and has been translated into 45 languages. In late 1990s the Ulyanovsk region was one of the more troubled areas in Russia. There were no large companies or lucrative businesses that could attract young, ambitious professionals. It was an all too-common scenario for recent university graduates to leave this provincial city for Moscow or St. Petersburg. Yury Zaytsev and Ruslan Fazlyev, students from Ulyanovsk Technical University, decided not to search for jobs, but to create their dream jobs themselves. These young programmers browsed the freelance marketplace and discovered that the most frequent requests concerned creating online stores. Fazlyev and Zaytsev were quick studies and took on a number of these kinds of orders. As the number of clients grew, they came up with idea to make a software platform that would create the stores automatically, rather than having to do it from scratch with each new client. In 2000, they founded their first company X-Cart, the world’s first ecommerce platform to use the PHP scripting language. Upon launching, the demo version was free but commercial users needed to pay a one-time licensing fee. During that time X-Cart’s biggest global competitor was IBM WebSphere Commerce. However, the WebSphere license cost hundred thousands of dollars, whereas X-Cart solutions cost only several thousand. While X-Cart was a useful tool primarily for talented users adept at coding and programming, Zaytsev and Fazlyev’s new venture Ecwid is as simple as playing with Legos. Created in 2009, this software solution allows users to seamlessly add an online store to any website or social network page in just five minutes. “We knew that there were numerous e-commerce companies that enable small and medium businesses to create an online store,” Fazlyev told RBTH. But he found that none of them offered customers the possibility of easily adding a store to their existing web presence. “X-Cart customers have flooded us with requests for this. We kept saying ‘this is not possible, no one does it.’ But then I thought: ‘Why not?’ And this is how Ecwid was started,” he recalls. Ecwid’s founders insist that with the easy-to-use services available, even an eight-year-old child could build a store on a social network. With offices in Ulyanovsk and Encinitas, California, Ecwid’s CEO says that location does not mean much for an IT company. 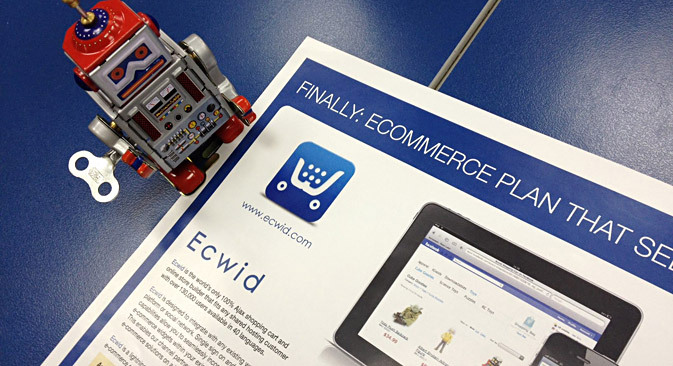 Ecwid’s international strategy has proven successful. Since moving to the U.S. the company has formed a partnership with Facebook to embed shopping carts on the social network. Merchants with up to 10 items in their store can use it for free while larger ones pay a maximum of $99 per month. The company has recently attracted investors to new e-commerce projects. In May the company raised $5 million from Russian-based international funds iTech Capital and Runa Capital. The latter previously gave $1.5 million to Ecwid in 2011. “Over the past five years we focused on AdTech & Processing, which are the most monetized segments on the web that are well positioned to grow globally once the technology behind it is developed and implemented,” said Gleb Davidyuk, Managing Partner at iTech Capital. Davidyuk contends that Ecwid’s integration with Facebook was a new approach to a well-known service.